ClubCoins Nødvendigt: 267 Please note that, for now, you cannot download content from our platform directly onto a mobile device (phone, iPod, iPad, tablets...). You need to download your items onto a PC or Mac, and then transfer them onto your device in the normal way. We are working on allowing direct downloads to mobile devices but this is not possible in the current version of the platform. Sorry about the inconvenience! NOTICE: Activation key must be used on a valid Steam account. Requires internet connection. 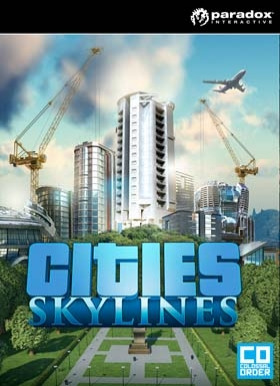 About the gameCities: Skylines is a modern take on the classic city simulation. The game introduces new game play elements to realize the thrill and hardships of creating maintaining the a real city whilst expanding on some well-established tropes of the city building experience. From the makers of the Cit… ies in Motion franchise, the game boasts a fully realized transport system. It also includes the ability to mod the game to suit your play style as a fine counter balance to the layered and challenging simulation. You’re only limited by your imagination, so take control and reach for the sky!Key Features Multi-tiered and challenging simulation: Constructing your city from the ground up is easy to learn, but hard to master. Playing as the mayor of your city you’ll be faced with balancing essential requirements such as education, water electricity, police, fire fighting, healthcare and much more along with your citys real economy system. Citizens within your city react fluidly, with gravitas and with an air of authenticity to a multitude of game play scenarios. Extensive local traffic simulation: Colossal Orders extensive experience developing the Cities in Motion series is fully utilized in a fully fleshed out and well-crafted transport systems. Districts and Policies: Be more than just an administrator from city hall. Designating parts of your city as a district results in the application of policies which results in you rising to the status of Mayor for your own city. Extensive modding support: Build or improve on existing maps and structures. You can then import them into the game, share them as well as download the creations of other city builders on the Steam workshop. System Requirements Windows - MinimumOS: Microsoft Windows XP/Vista/7/8/8.1 (64-bit)Processor: Intel Core 2 Duo, 3.0GHz / AMD Athlon 64 X2 6400+, 3.2GHzMemory: 4 GB RAMHard Drive: 4GB free hard disk spaceGraphics: nVIDIA GeForce GTX 260, 512 MB / ATI Radeon HD 5670, 512 MB Windows - RecommendedOS: Microsoft Windows XP/Vista/7/8/8.1 (64-bit)Processor: Intel Core i5-3470, 3.20GHz / AMD FX-6300, 3.5GhzMemory: 6 GB RAMHard Drive: 4GB free hard disk spaceGraphics: nVIDIA GeForce GTX 660, 2 GB / AMD Radeon HD 7870, 2 GB/li>	Linux - MinimumOS: Ubuntu 14.04 64-bit Ubuntu 14.10 64-bit Ubuntu 12.04 64-bit Ubuntu 14.04 (64-bit)Processor: Intel Core 2 Duo, 3.0GHz / AMD Athlon 64 X2 6400+, 3.2GHzMemory: 4 GB RAMHard Drive: 4GB free hard disk spaceGraphics: nVIDIA GeForce GTX 260, 512 MB / ATI Radeon HD 5670, 512 MB	Linux - RecommendedOS: Ubuntu 14.04 64-bit Ubuntu 14.10 64-bit Ubuntu 12.04 64-bit Ubuntu 14.04 (64-bit)Processor: Intel Core i5-3470, 3.20GHz / AMD FX-6300, 3.5GhzMemory: 6 GB RAMHard Drive: 4GB free hard disk spaceGraphics: nVIDIA GeForce GTX 660, 2 GB / AMD Radeon HD 7870, 2 GB/li> Mac - MinimumOS: OS X 10.10 OS X 10.9 OS X 10.9 (64-bit)Processor: Intel Core 2 Duo, 3.0GHz / AMD Athlon 64 X2 6400+, 3.2GHzMemory: 4 GB RAMHard Drive: 4GB free hard disk spaceGraphics: nVIDIA GeForce GTX 260, 512 MB / ATI Radeon HD 5670, 512 MB	Mac - RecommendedOS: OS X 10.10 OS X 10.9 OS X 10.9 (64-bit)Processor: Intel Core i5-3470, 3.20GHz / AMD FX-6300, 3.5GhzMemory: 6 GB RAMHard Drive: 4GB free hard disk spaceGraphics: nVIDIA GeForce GTX 660, 2 GB / AMD Radeon HD 7870, 2 GB/li> © 2015 Paradox Interactive™. Trademarks belong to their respective owners. All rights reserved.